If you’re following the street rod building coverage we’ve provided on Bob Hamilton‘s 1927 T roadster project or if you’re one of the many StreetRod 101 DVD Library collectors, you’re no doubt curious how Bob Hamilton’s street rod building history. We had the opportunity to sit with Bob for an interview where he was kind enough to outline how he gained his first exposure to hot rods and how his street rod building knowledge began. His story has humble origins and is something anyone with desire and mechanical aptitude could have followed. The nice thing is that Bob endured all the missteps and frustration years ago and learned from his mistakes. His StreetRod 101 DVD Library of street rod building skills enables you to take advantage of the decades of skills, techniques and shortcuts that Bob developed the hard way. So kick back for an informative four minutes when you click below to view this portion of our interview with Bob. 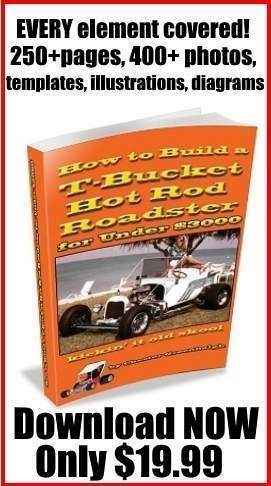 Street rod builders around the world find these in-depth “how to” DVDs invaluable in terms of the comprehensive information they provide as well as the clear, simple and helpful way in which Bob Hamilton offers his acquired knowledge. And if you don’t already own the complete collection, there’s no better time than right now. Street Rod Building How-To Video Library Save on More Than One DVD Set! So click here to go to StreetRodPlans.com now.